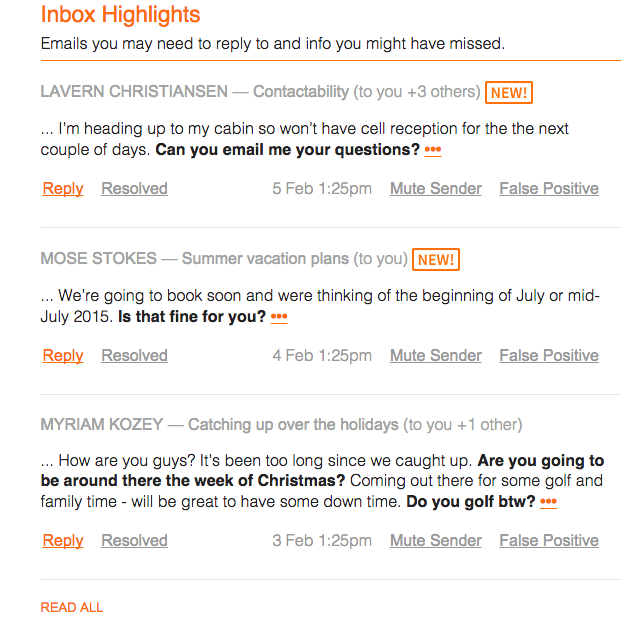 InboxVudu, a new service that is launching today, aims to surface the things that are most important in your inbox. The service connects to your Gmail or Google Apps account and analyzes incoming emails for what you need to respond to and when. At the end of each day, the service sends you an email with the things that need to be done. The daily email recaps aren’t just a straight copy and paste of the emails from that day. Instead, InboxVudu creates a ‘too long, didn’t read’ version of the email that extracts only the text that needs to be actioned, along with details you might have missed. For senders you don’t want to be reminded about, you can mute them so they don’t appear again. The service is pretty smart, often pulling out the most relevant part of the email to me which saved a decent amount of time. I found it useful for dealing with my inbox overload during the week; it helped knowing that if I didn’t reply to an email right away and it got buried that InboxVudu would resurface it for me later. InboxVudu also checks your recently sent emails and surfaces those where you asked the recipient to do something but they didn’t reply. This reminds you to follow up, which can be handy if you send a lot of email like I do. The service is launching today, which will be free to individual users. Those that want to take it for a whirl can use our unique link to get in right away.